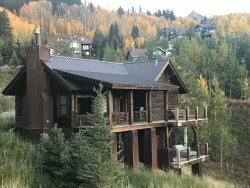 So what's so special about Crested Butte? In a word: Everything. Roughly four and a half hours and a few mountain passes away from Denver, you’ll find stunning Crested Butte, Colorado. This is much more than a beloved ski destination; it’s the last true Colorado mountain town! Here, a welcoming spirit drives everything we do. Our local coffee shops and breweries are just as important as the Double-Black Diamond skiing offered on majestic Mt. Crested Butte, and every local is willing to share a story or two about their favorite place in the world. Here, the untamed wilderness that surrounds our amazing town influences everything it touches, down to our gorgeous vacation rentals. Whatever you’re seeking on your trip to Crested Butte, you’ll leave having discovered it! Here in our high-altitude paradise, there’s so much to do. You won’t find any of the Aspen glitz or weekend warrior crowds here, but that’s what makes us a diamond in the rough! Play a great game of golf against a breathtakingly beautiful mountain scene, or mingle with local ski buffs at Crested Butte restaurants and bars. Whatever you choose to do among this tightly knit community, you’ll see that Crested Butte truly defines “down to earth” in every way. Here you'll find links to some of our favorite Crested Butte resources. For more information to help plan your trip, see all the great things to do in Crested Butte, CO, or contact Alpine Getaways. Then, explore our vacation rental properties! One of the most amazing parts of visiting an intimate mountain town like Crested Butte is the array of intriguing art galleries, museums, and historic sites offered. Here, you`ll find plenty of original works of art and engaging history lessons off the streets of our storied town. Whether you`re traveling solo or bringing the whole family, there`s something that will satisfy even the most artistic of tastes! Here are our favorite local landmarks for great art and rich history. Crested Butte is known for its amazing mountain biking and skiing. Check out all of our recommendations for making your trip here a great experience! Looking for a great time? Needing a night out? Crested Butte`s nightlife is one-of-a-kind. Whether it be the hair of the dog, some locally crafted cocktails, or a few Colorado craft brews, cruising down Elk Ave will be a memorable experience. Check out all the best resources for fishing around Crested Butte, Colorado. Check out our recommended list of local services around Crested Butte. Looking to for an outdoor adventure in the mountains around Crested Butte? Nothing brings you closer to our grand alpine landscape quite like visiting Crested Butte`s many scenic destinations, each uniquely defining the area`s natural allure. This is a popular destination for winter sports enthusiasts, and for good reason! In our winter wonderland, skiing, snowboarding, snowmobiling, and dog sledding are all ideal ways to fill your time. While on other outdoor adventures, you can hike gorgeous wooded trails, gaze upon waterfalls, go paddling, or even embark on a horseback riding excursion! If you wish to spend your day taking in the fresh mountain air, there`s no better place to be than Crested Butte. Here are the top things to do for outdoor enthusiasts! Check out our resources for exploring this beautiful area and everything it has to offer. Just because Crested Butte is a small mountain town doesn`t mean you can`t dine on amazing food! Here, you`ll find everything you`re craving. Want a world-class margarita, spicy Bloody Mary, or refreshing pint of IPA? What about comfort food, outrageous tamales, or gourmet French cuisine? We`ve got you covered! There are countless local restaurants and bars in Crested Butte worth visiting; here are just a few of our favorites. Isn`t vacation meant for relaxation? Treat yourself and feel rejuvenated at one of these salons and spas in Crested Butte! Crested Butte shopping is a truly one-of-a-kind experience. Searching for angling equipment, toys, souvenirs, clothing, or local pieces of art, the shops along Elk Avenue and beyond sell just what you`re looking to buy. Avid shoppers will love these five popular stops in Crested Butte! For more information regarding any of these events, or to find out more, contact Alpine Getaways and we`ll tell you about anything and everything else going on in Crested Butte!